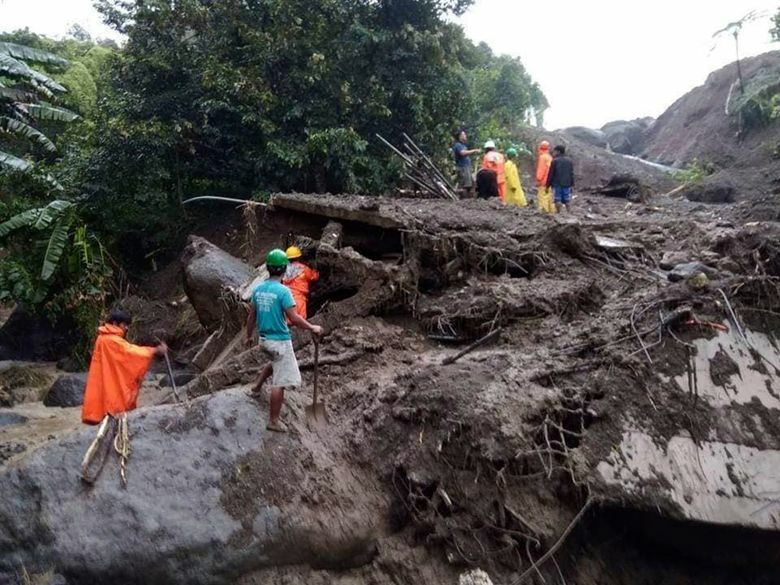 MANILA, Philippines (AP) — Rescuers pulled out four bodies and four survivors but at least 19 others remained missing Wednesday after a massive typhoon-triggered landslide crashed down on two government buildings in the northern Philippines, officials said. Regional police Chief Superintendent Rolando Nana said rescue efforts by more than 100 police, firefighters and volunteers were halted at nightfall in remote Natonin in Mountain province and would resume at daybreak. Rain and mud have hampered the frantic search. 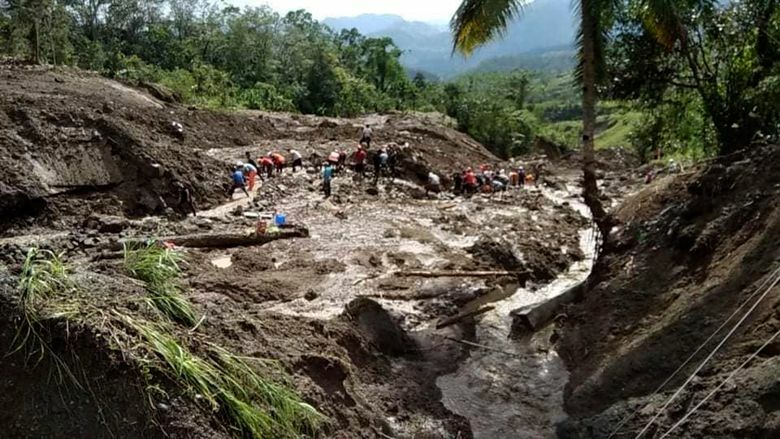 Smaller landslides on roads leading to Natonin have slowed the advance of more rescuers and earth-moving equipment, Nana said. 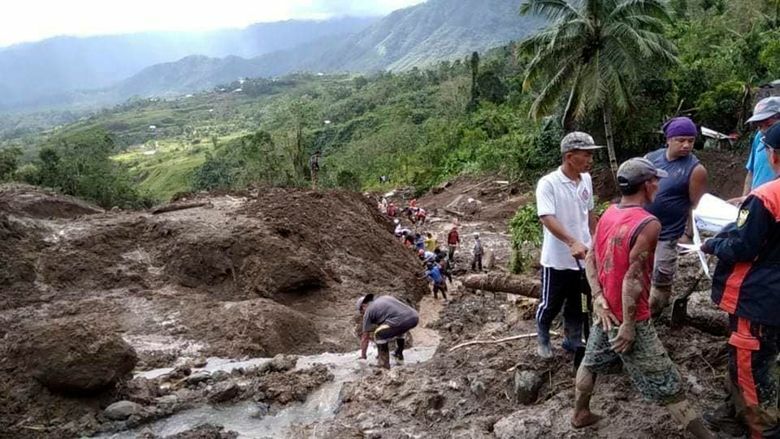 Disaster response officials said at least 19 people remained trapped in the landslide, which occurred as Typhoon Yutu pummeled the region Tuesday. A rescuer en route to Natonin died in still- unclear circumstances. About 14 villagers were injured in the landslide. At least 11 people have died in the northern Philippines because of the typhoon, mostly due to landslides. “It’s a massive landslide and boulders also came rolling down from the mountain. The buildings got demolished and entombed. They’re gone,” government engineer Junel Emengga told The Associated Press by phone from the site of the landslide. Rescuers used shovels and their hands to search for survivors in the avalanche because earth-moving equipment could not pass through the blocked roads, he said. The landslide buried a building that was being constructed and an older one that was being expanded for the Department of Public Works and Highway. Five nearby houses were also hit, he said. Emengga said he and other staffers of the public works department did not report for work at the four-story buildings Tuesday because of the raging typhoon, but other employees of a private construction company were in the buildings. Nearby residents also sought shelter in the buildings as the typhoon roared, he said. Typhoon Yutu weakened considerably from its earlier super typhoon status over the Pacific Ocean before slamming into the northeastern Philippines before dawn Tuesday. It knocked down trees and power posts and ripped roofs off houses, officials said. 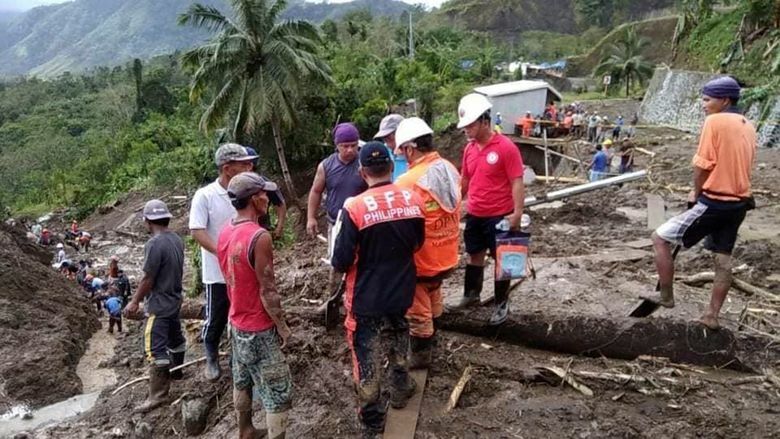 The typhoon weakened further as it blew westward across landslide-prone mountain and lowland provinces still recovering from Typhoon Mangkhut in mid-September. Yutu blew out into the South China Sea later Tuesday and weakened into a tropical storm, forecasters said. “The deaths and damages caused by these typhoons should really prompt people to reassess the hazards around them. It can be a matter of life and death,” Nana said.